I’m joyful that my little Columbine plant, after barely hanging on for years, has been relocated into yummy new soil and is flourishing like never before! We can all flourish under the right circumstances. The trick is how to do so when things are not going as we hoped/wanted/assumed/planned? Right now, my back is “out.” It’s uncomfortable, limiting, and even a little scary, yet I’ve found that when I reflect on the catastrophic challenges that some people face – and often overcome – it snaps me right back into appreciation and kindness mode – for myself as well as others. On that note, I do believe that I’ll honor the need to take it easy for a few days. Here’s to a joy filled Thursday, everyone! ~ by Dawn Elliott on May 19, 2011.
good morning dawn. 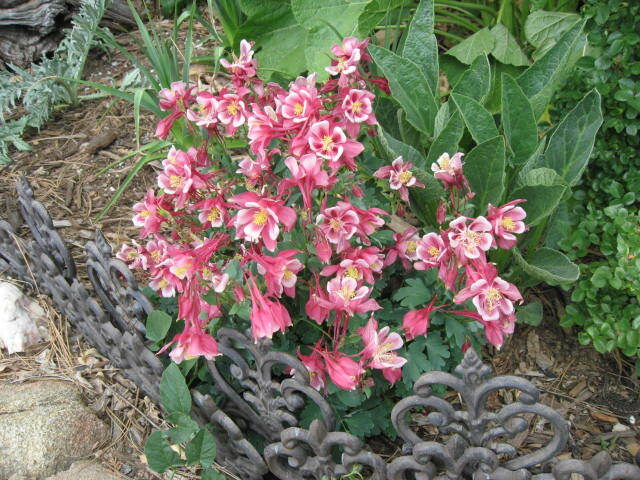 your columbine is a burst of beauty! and yesterdays rain? certainly that is a welcome jOY. may your return to comfort be swift. i know this trickiness you are alluding too, this reaching beyond, this desire to rise above the challenges of our earthly bodies and make a bright difference regardless of circumstance. and sometimes…because of them! I can relate…I have suffered back issues and have also thought about how others deal with so much more than this pain. Hello Dawn. Sending you well wishes and comfort. The back is a painful journey when it is not up to par. Yes we can all be thankful despite the hardships that we have to face sometimes. I wish you a speedy recovery and take some time to yourself. Love your Columbines and do you know that I don’t have any of those flowers. They are beautiful. Take care, be well and smile. Maybe having a crabby back is your body’s way of giving you a little down time. Spend some time dreaming and thanking your back for all the hard work it does for you every day! I hope that you take the tine to baby yourself and give your back the love it deserves. Thank you for this beautful offering of flowers, so lovely and so bright and full of energy when you may not be feeling the same. Holding you in the light.